Sadly, fitting a snorkel to a Defender Puma does not guarantee safe water crossings. The original ducting from the back of the snorkel to the air filter box is poor fitting, push together plastic with gaps big enough to drive a Range Rover through. No sealant, not clamped….hardly a sealed system. Image how much water could poor through the gaps in the factory ducting showing in the picture. Clearly, push together plastic just doesn’t cut the mustard. Now there is a solution with Nugget Stuff’s replacement kit. 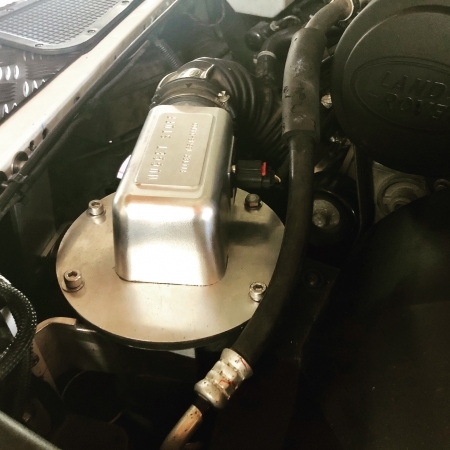 Comprising a replacement air box which screws to the inside of the inner guard and an adaptor for the air filter box end allowing the 2 to be connected with a 90mm 2ply silicon hose which is clamped in position. The air filter box adaptor and replacement air box are moulded from tough polyurethane. The air box lid and body are sealed to ensure an airtight seal. The kit contains all components, including a tube of Sensor Safe sealant and stainless steel clamps and takes 2-3 hours to fit. Compatible with most snorkels.